Yeah, but: I'm not a video person. 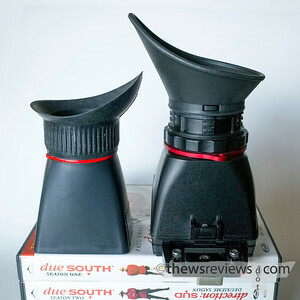 The Long Version: I was just starting a project that had me manually-focusing my D800 outdoors when I had the chance to try out the Kamerar QV-1 head-to-head with my classic Hoodman Hoodloupe. I bought the QV-1 on the spot. The Kamerar QV-1 is a magnifying viewfinder loupe that's designed for recording video with the ergonomic nightmares that are HD-SLRs. As such it's specifically designed for hitting focus with an LCD screen in unfavourable light, which suits me perfectly even though I don't shoot footage. 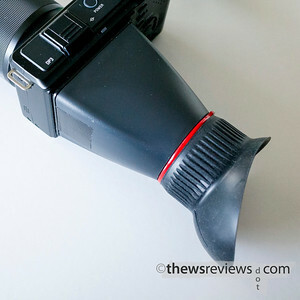 The viewfinder has a 2.5x magnification, which is enough to see pixels, and a big eyecup that's reversible for us left-eyed people. 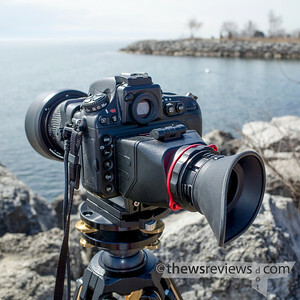 The viewfinder attaches to a dedicated tripod plate via a magnetic tab, which holds the viewfinder quite securely despite latching at only one point. 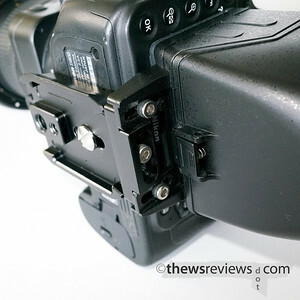 The viewfinder position is adjusted on the camera with hex bolts – wrench included – which makes it time-consuming to switch between camera models; the whole plate can side front-to-back to snug the finder up to the LCD. The plate is compatible with the Manfrotto 501PL, so it will fit on some of their video heads with no further difficulty. If a different plate is needed then there are screw points for both 1/4" and 3/8" attachments. 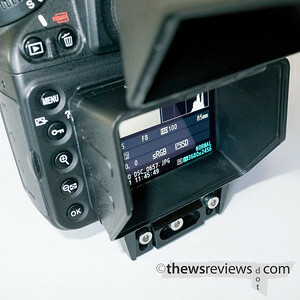 The viewfinder attaches securely, but doesn't seal hermetically – there can be a slight gap at the top and sides of the LCD that lets a little stray light in. I don't see any way to do a better seal without sticking a mounting frame onto the camera, though, which is a level of commitment that I'm not willing to make. 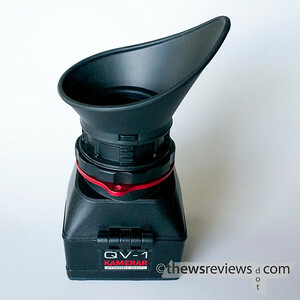 The QV-1 has a hinge and a latch that lets it fold upwards without needing to be removed from the camera. 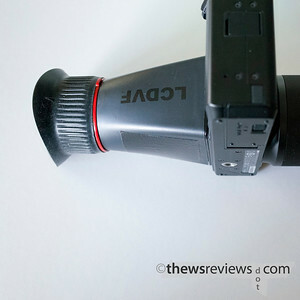 This is essential if the camera has a touch-screen, and I'd sometimes use it when I needed to change settings, although it isn't that difficult to find all the buttons while looking through the eyepiece. Yes, after two years with my D800 I still get confused between the + and - viewing buttons, but trial and error is part of the learning process. 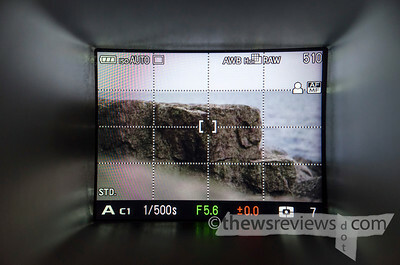 Naturally it's not possible to use the cameras' own eye-level viewfinder with the LCD hood attached. That's a good reminder to close the OVF shutter, which is recommended when shooting on a tripod or with live view anyway. This viewfinder, like most of them, is pretty big. Budget some extra space in the camera bag – it isn't heavy, but it's as bulky as a lens. It includes attachment points for a lanyard, so that it can be worn hoodman-style, but I'd never do it. There is a cautionary note that sunlight can be focused through the viewfinder and burn the camera's LCD, so that is a reason to take it off when it's not actively being used, but that's still no excuse for treating it like a fashion accessory. I put it in my jacket pocket or camera bag instead, and so far the rubber eyecup hasn't shown any tendency to collect lint. I've never used the viewfinder brand that costs four times as much as the Kamerar and sounds like a hobby knife, but I've been pretty happy with the QV1. It's certainly good enough, it's a nice match for my SLR, and it costs about what I'm willing to spend given my low-key and rather undemanding usage. It's not one of those things that makes my heart sing with joy, but it's good enough that I wouldn't replace it, and it has proven useful enough as a concept that I bought a different LCD viewfinder for another cameras as well. More on that here. Yeah, but: It's a classic. The Long Version: The Hoodman Hoodloupe, patent US 7,386,229 B2 and 7,034,877, was the first thing I thought about when I needed to use my D800's live view for manually focusing a lens when outdoors. And why not? It's been around forever – I remember seeing ads for it back in the days of actual print magazines, so it must be good to still be on the market. 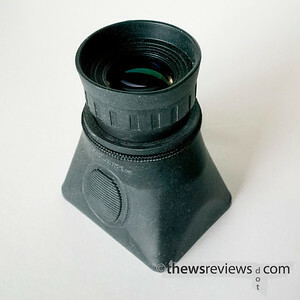 The Hoodman Hoodloupe is very slightly misnamed: it is a hood, but loupes typically offer magnification, which the Hoodman doesn't. 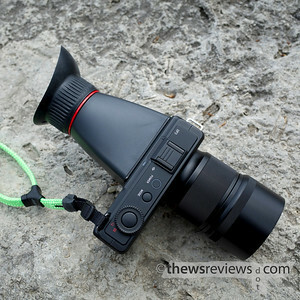 Instead it has a diopter correction eyepiece and sturdy sides that block out stray light, making the camera's LCD easier to see by cutting out glare and distractions. 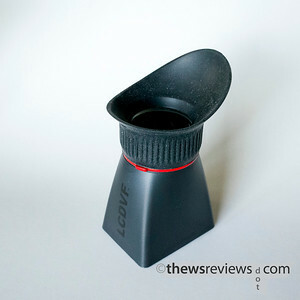 It is used like a loupe, however, being hand-held and moved into place each time it's needed. 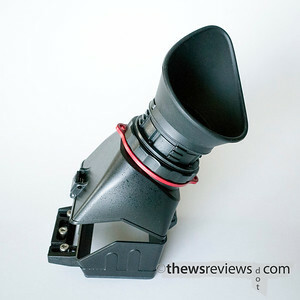 The Hoodloupe is clearly an idea that predates the era of SLR cameras that capture video, and the mirrorless revolution that followed it. The need to see the camera LCD clearly in any light was once the exclusive difficulty of photographers using tripods and seeking critical sharpness as they leisurely take photos of churches and mountains. 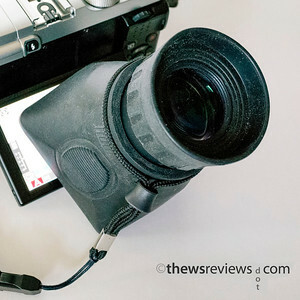 If that's all that it's asked to do then the Hoodloupe performs well, but there's a new generation of video-inspired LCD magnifiers out there that have surpassed it for all-around use. The Hoodman does still have some advantages over most of the newer products on the market: it's well-built, simple, small, and comparatively inexpensive. Even today it would be a good choice for anyone making a pilgrimage to the great tripod-holes of the American midwest or west coast. If this is something that's on your bucket list then consider picking one up – mine's available for $40, tax and shipping included.